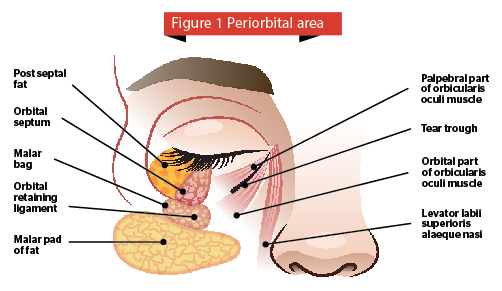 The peri orbital area is extremely sensitive are both in terms of the anatomy and also in the personal and emotional connotations that come with having treatment to this area. Although the tear trough (the depression that runs from your inner eye down to the cheek) is a natural anatomical variant (babies have tear troughs!) a deepened or depressed tear trough as a result of volume loss, lack of support from the overlying skin and genetics can result in a sunken and tired appearance. Many people also have a further depression on the outer sides of the eye (lateral tear trough) and a sunken appearance at the ‘lid cheek junction’ a combination of puffy eyes and eye bags (small fat pockets) can make someone look tired and much older. The usual presentation is with a patient saying . "I look tired all the time and I am sick of people commenting"
Treatment of this area does not come from vanity but from a desire to look the way you feel. Although the treatment methods for the periorbital area are vast, the following will focus on the use of dermal fillers for the tear trough. Primarily to target volume loss and loss of natural contours. After a full consultation and determination of patient suitability (eg correcting any cheek volume loss if needed) then the correct dose will be determined. The dose is very individual but many will require 2-3 treatments (2-3ml total) spaced at 3-4 week intervals. Once a full correction has occurred top up treatments of 1ml can be done every 12-18 months. My preference is to use a blunt ended microcannula in this area to minimise complications. A needle can also be used for very fine and accurate injection. This area is very sensitive and best left to more advance injectors. The majorities of complications from dermal fillers come from treating this area! Because of the sensitivity of this area there are some EXPECTED side effects which is why it is extremely important to schedule your treatment with these in mind. Bruising – this is always a possibility with any cosmetic injectable. Although a cannula will ensure a reduction in this risk it is still highly likely. A bruise is just a bruise and will settle, in no way affecting the end result. Asymmetry – everybody (well most of us mere mortals) is asymmetrical and have more or less volume loss on one side of our faces. This is especially true for the tear trough area. Although attempts at full correction will occur there may be small amounts of asymmetry that will be further corrected at the second treatment. Asymmetry can also occur due to different levels of swelling (this is true for ALL dermal filler treatments) and is why we do not do any further treatments until all swelling has settled after 4 weeks. Do not panic if you have bruising or swelling after the treatment! I strongly advise all patients to come for their review at 4 weeks for their second treatment. Optimal correction may take time and you may need more than the 1 syringe of filler that your friend may have had. Cosmetic medicine is not an exact science and treatments are tailored to the individual. Tailoring a treatment plan and working with individual patient anatomy is what makes cosmetic medicine an art and sets apart advanced and novice injectors. What is the cost you ask? 1ml of dermal filler (the exact type/brand is also individualised to the patient) costs from $750. Full pricing can be viewed here.